Third party sellers make up +50% of our $10 billion annualized sales run rate. $39.99 a month + additional selling fees. Manufacturers and distributors who are new to Amazon or are existing Professional Sellers now have a targeted way to reach business customers on Amazon. With a specialized suite of tools to enable B2B e-commerce, small businesses to large enterprises will find new ways to engage incremental business customers through a trusted Amazon experience. 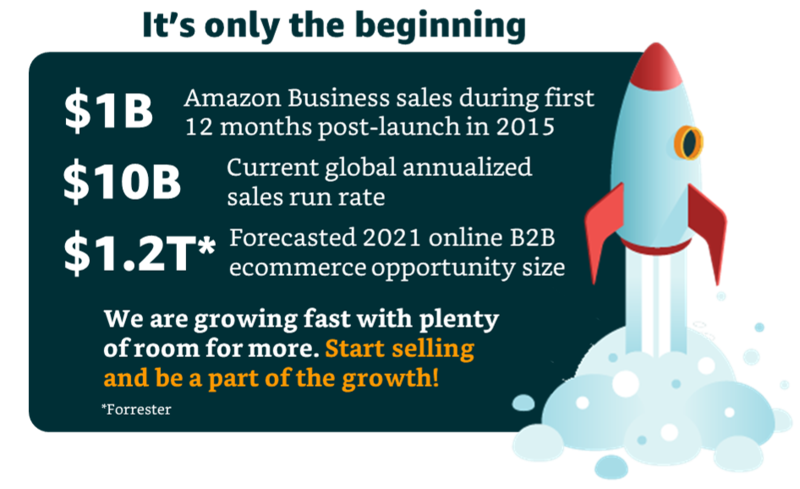 Amazon Business is the B2B marketplace on Amazon, providing business customers with the pricing, selection and convenience of Amazon, with features and benefits designed for businesses of all sizes. Register for a Professional Selling Account on Amazon.com. For existing sellers, you can add Amazon Business features easily through Seller Central. Tell your unique story using our Profile Editor. You can add your quality certifications and diversity credentials for discerning business customers. Use our simple listing tools to add your entire catalog and the Enhanced Content feature to display additional product information to your customers. “Through the years, from being a traditional business, to seeing the ever-changing economy and global landscape of business, Tensator was looking for ways to expand our customer reach as we move into the digital platform. We saw the opportunity with Amazon Business to take control of our brand and reach new customers through one channel." What are the differences between Amazon Business and Selling on Amazon? As an Amazon Business Seller, you have access to all of the features of a professional selling account with Amazon.com. In addition to Selling on Amazon features, becoming an Amazon Business Seller allows you to cater to the specific requirements of business customers by providing features optimized for business-to-business transactions, including quantity pricing and business pricing and more. How much does it cost to list products as a Business Seller? When I’m a Business Seller, who will be able to buy my products? As an Amazon Business Seller, you’ll enjoy all the privileges of a Professional Selling Account, with access to millions of customers across all of Amazon’s categories. You’ll also be able to reach business customers directly with a set of exclusive features, including the option of restricting purchases of listings to business customers only. Millions of businesses across a variety of industries purchase the products they need on the Amazon Business Marketplace. How do I join the Amazon Business Seller program? Businesses that register for a Professional Selling Account through Amazon Business will receive the benefits of the Business Seller program upon registration completion. Click here to get started! Existing sellers with a Professional Selling Account can join at no additional cost here. Can I still use other Amazon Services? How are orders fulfilled by Amazon Business Sellers? 1. Seller-fulfilled Prime – For sellers who qualify, based on their own mature fulfillment and logistics infrastructure, Seller-fulfilled Prime enables offers to achieve Prime status, but ship directly from a seller location according to the Prime customer promise. 2. Fulfillment by Amazon (FBA) – Orders are fulfilled by Amazon and your products are shipped from state-of-the-art Amazon fulfillment centers. Orders fulfilled through FBA achieve Prime status. 3. Merchant fulfillment – Just like it sounds; you fulfill orders directly from your own facility, following the Amazon Business packaging requirements. Prime status does not apply to merchant fulfilled orders. 4. Hybrid approach – Many organizations use a mixed fulfillment strategy, shipping certain products directly and others through Fulfillment by Amazon. Why participate in the Seller Credential Program? How do sellers claim a credential? Once registered as an Amazon Business Seller, the seller will choose from a list of credentials to claim and provide supporting information. Depending on the credential, sellers will need to upload a picture of a physical certificate or a business identifier number (such as DUNS). Will Amazon help sellers get credentials? How will business customers find sellers’ credentials? Credentials will be exposed to customers throughout the customer’s shopping experience. Additionally, a list of each seller’s credentials will be displayed prominently on seller profile pages. Confused about how you might fit? and we'll help you determine how to get integrated with Amazon. Business pricing means offers that are lower than your retail prices that are intended to incentivize customers to purchase in bulk. When you set a business price, these special offers are only available to registered Amazon Business customers. While your products will be visible to all Amazon consumers, only registered Amazon Business customers can see and read your business pricing. All other Amazon consumers will see your set consumer price. Business pricing cannot be higher than the consumer price on a product. Quantity discount: Create tiered discounts specific to your products for business customers that prefer to purchase higher-volumes. Business customers can submit the number of units that they would like to purchase. If you sell that product, you can respond to these requests with a discounted offer. You can help potential customers better understand your products by uploading detailed information to your product pages. From manufacturer specs to user guides to CAD drawings, this enhanced content helps answer specific and technical questions, so purchasers can make informed buying decisions. Your profile page enables you to share information about your business to business customers. Display your logo, year established, business type, and more. Business customers see this information when they click your seller name in the Buy Box, in the Ships from and Sold by line on a product detail page, or on the product's More Buying Choices and Offer Listings pages. Having a Business Profile gives business customers an additional level of confidence that they are making informed buying decisions. Sales Snapshot: allows you to view the growth of your B2B sales from registered business customers (B2B) in contrast with that of non-business customers (non-B2B), and to compare your Year-over-Year (YoY) growth among both customer segments. B2B Performance by Industry: shows you the breakdown of your B2B sales by the industry and sub-industry segments of your customers. We use both internal and external data sources for segmentation data on business cstomers. Top Products: displays your top five products selling to registered business customers on Amazon. Business Action Center: displays tasks that are relevant to your B2B business. Each task in the list includes both a link to the page on Seller Central and a Dismiss button. Please let us know what we can improve to serve you better.